Deliciously sweet homemade latte infused with eggnog. 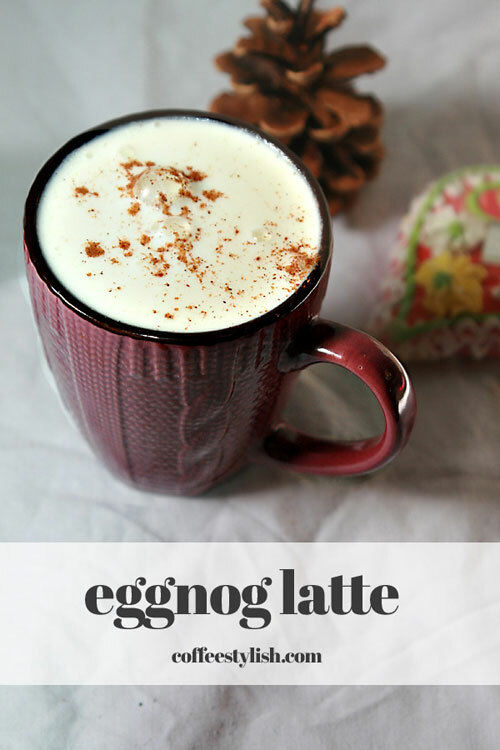 I’m not a fan of drinking eggnog but I love anything eggnog flavored, and this latte is my favorite! The recipe is simple, easy-to-follow and all you need to put this holiday treat right over the top is a pinch of nutmeg. Enjoy! Make one double espresso shot or brew 1 espresso pod. If you don’t have an espresso machine, substitute with 1/2 cup black coffee. Combine eggnog and milk and steam with the steam wand or heat it in the microwave. Slowly add the mixture to your coffee while stirring. Add sugar if needed. Garnish with whipped cream and sprinkle nutmeg on top. I must make this coffee recipe, i will not forget to add Eggnog. This sounds very delicious. Could use two of this delicious Eggnog Latte right now!